Ful Medammes or slow cooked Fava Beans, is truly the only food that is guaranteed to keep you full through most of your fasting day. It is an ancient dish, dating back to the Pharaohs, that is somewhat a traditional Egyptian breakfast nowadays. Being cheap and easy to prepare, it the perfect sohour. There are many recipes for ful, but the Egyptian recipe is the most commonly preferred one. 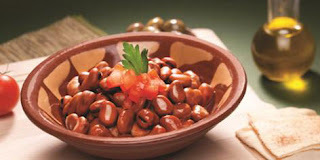 • 2 cups of small Egyptian Fava beans ( ful medames), soaked overnight with skin on. • Soak the beans overnight for 8- 10 hours then drain. • Place the beans, garlic, and cumin in a large saucepan and cover with fresh, un-salted water. • Remove from heat and start mashing with a potato masher or a fork. • Stir in the lemon, oil, salt, parsley, and chili pepper. *Tahina, onions, and tomatoes give an added taste to the recipe.